The private Bucksgahuda & Western Railroad (B&WRR) started in 1966 when the Bauer brothers of St. Marys, PA, purchased a German-built steam locomotive through an advertisement in Trains magazine, and shipped the engine from Germany through Philadelphia to St. Marys. B&W #1, named "Otto" by the crew of the merchant ship that hauled the 1939 0-4-0 2 foot gage Henscel across the Atlantic, has been operating in western Pennsylvania ever since (longer than it ever did in Germany). Little did all involved know then that 40 years later the B&WRR would not only still be operating every year, but has expanded to an operation unlike anything else complete with shops, turntable, and over a mile and half of 2 foot track. The first 15 feet of track was laid here just before the locomotive arrived, and the original engine house had to be built around the engine! 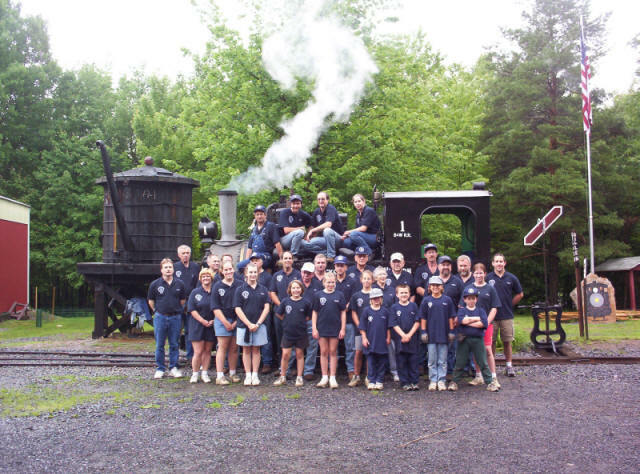 After reconditioning this first locomotive, other equipment, rails, ties, and supplies were acquired over the years, notably in 1981 when the Joyce National Powder Co. of Eldred (PA) donated the entire plant railroad. Group photo, posed in front of B&W #1, at B&WRR's 40th Anniversary celebration. The author is in the bibs near front of loco. Photo by Tom Bauer. With this additional equipment, interest in the project continued to grow and something new is added every few years. The large engine house was first constructed in 1983 and enlarged twice; the bridge built in 1985, the loop of track finished in 1986, and the turntable and water tower were added in 1992. In 1993, we were fortunate to acquire a diesel-electric locomotive and a Shay-type steam locomotive. The last few years have also seen the addition of two additional enginehouse buildings and a 60' standard gauge boxcar were added for additional storage, as well as construction of the quarter-mile "Camp Branch" line on the original St. Marys and Southwestern Railroad grade. 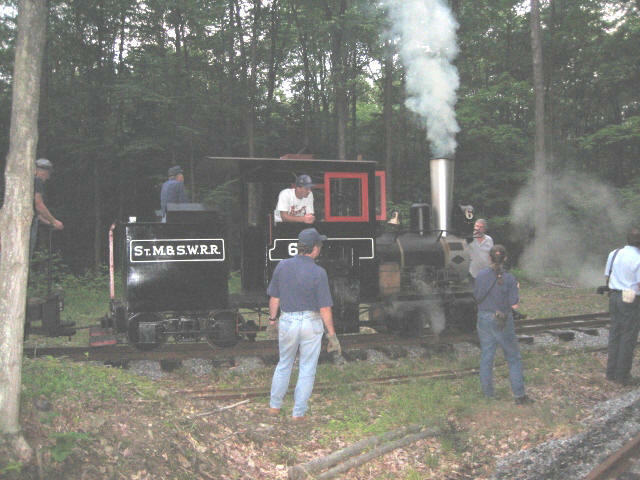 The author has his back to the camera while talking to Tom Bauer in the cab of Shay #6 while turning on the "Camp Branch's" wye Saturday night. This branch is actually built on the Saint Marys & Southwestern Railroad grade (a Pittsburg, Shawmut & Northern predecessor). Photo by Art Martin. To commemorate B&WRR's 40th Anniversary, a private celebration was held the weekend of July 1st in Saint Marys, PA. Both steam locomotives, "Otto" and the Shay, operated all weekend with various members taking turns enjoying time at the throttle.